This is a book about a world in a life. 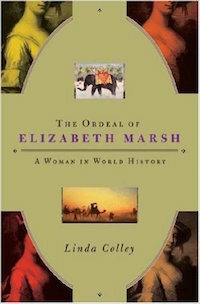 Conceived in Jamaica and possibly mixed-race, Elizabeth Marsh (1735-1785) traveled farther and was more intimately affected by developments across the globe than the vast majority of men. She was the first woman to publish in English on Morocco, and the first to carry out extensive explorations in eastern and southern India. A creature of multiple frontiers, she spent time in London, Menorca, Rio de Janeiro, and the Cape of Africa. She speculated in Florida land, was caught up in the French and Indian War, linked to voyages to the Pacific, and enmeshed as victim or owner in three different systems of slavery. She was also crucially part of far larger histories. Marsh’s experiences would have been impossible without her links to the Royal Navy, the East India Company, imperial warfare, and widening international trade. To this extent, her career illumines shifting patterns of Western power and overseas aggression. Yet the unprecedented expansion of connections across continents occurring during her lifetime also ensured that her ideas and personal relationships were shaped repeatedly by events and people beyond Europe: by runaway African slaves; Indian weavers and astronomers; Sephardi Jewish traders; and the great Moroccan sultan, Sidi Muhammad, who schemed to entrap her. Many biographies remain constrained by a national framework, while global histories are often impersonal. By contrast, in this dazzling and original book, Linda Colley moves repeatedly and questioningly between vast geopolitical transformations and the intricate detail of individual lives. This is a global biography for our globalizing times.